This week brought more ways than ever to get your Chipotle fix. 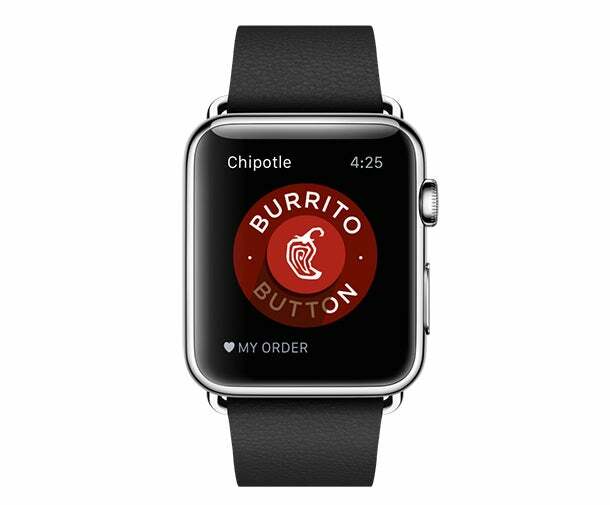 Today, Chipotle launched a mobile application for the Apple Watch, allowing customers to order from their wrists. Similarly to Domino's smartwatch app, the mobile app is designed for preexisting customers and saves your recent and favorite orders for a speedy re-ordering process. After ordering, the watch provides a countdown of how long until the order will be ready at the Chipotle location of your choice. The news comes on the heels of yesterday's announcement that the chain has begun offering delivery for online and mobile orders in 67 cities using Postmates, an app-based delivery startup. While the company only announced the partnership this week, Postmates has been officially delivering Chipotle offerings since March, with Chipotle reporting a 30 percent month-over-month growth on delivery orders. This is the chain's first official delivery partnership, and costs customers between $4.99 and $7.99 on top of their order. "There have been a lot of people that have been delivering Chipotle through various services over the years. And we've tried to in a lot of cases shut them down, because we weren't sure whether the quality was going to be sufficient or whether they were following our rules," Chipotle's chief creative and development officer Mark Crumpacker said in the company's earning's call. "This is different because we've made an official deal with Postmates and they have been delivering Chipotle for a quite a while too." Postmates previously made headlines when Starbucks announced in March it would collaborate with the startup to delivery coffee and other menu items in parts of Seattle. While Starbucks has integrated delivery into the chain's mobile app in select areas, so far it looks as though Chipotle delivery will still be through the Postmates app. Currently only 6.6 percent of Chipotle sales come from mobile ordering. However, with the Apple Watch app and an app-based delivery option, the burrito chain is clearly looking to boost the percentage a few points. Chipotle executives have said that they hope to integrate Apple Pay on the mobile app, as well as Google Wallet in the Android app, by the end of the year. The company is also recently relaunched chipotle.com to make the website more mobile-friendly. "We still think that our mobile ordering… could do a lot more with the ordering, with the payment, with the way that we accommodate those orders in restaurants," Chipotle CFO John Hartung said in the company's earning's call. "So we think we have a lot of room to do a better job with all that." While Chipotle believes there is room for improvement on the mobile front, overall, the chain is doing well. The company reported on Tuesday that same-store sales increased 10.4 percent in the first quarter. However, while revenues increased 20.4 percent to $1.09 billion, Chipotle fell short of analysts' predictions of $1.11 billion.